In March, Prizes Awarded for the Biggest Fish of Any Type Caught. 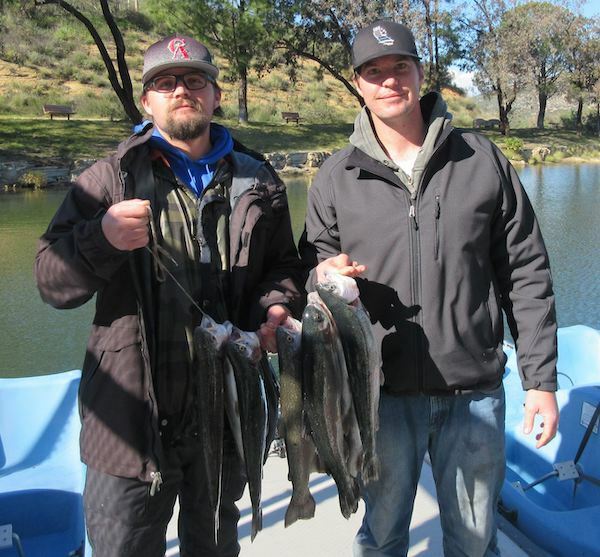 Kevan Koskie and Ricky Record both caught their limit of trout this Friday (photo). The eight fish combined for a total weight of 17 ¾ pounds. They were trolling the East side of the lake and using night crawlers for bait. Jeff Kopischke and his son got their trout limits on Saturday and added a catfish for good measure. For the first time ever, Lake Poway will be hosting its own version of March Madness, fishing edition. Each week in March there will be prizes awarded for the biggest fish of any type caught. The competition is open to all ages. Fish must be weighed and recorded at the boat dock. See our website for details. https://poway.org/401/Lake-Poway. Since our next stock will be Trophy Tailwalkers there should be some big fish caught for the contest. Next stock: February 27th, 1,500 pounds of Trophy Tailwalkers. Stocking schedule subject to change. When you stop by concessions to buy your permit ask about the best spots and baits. They have up to the minute information. Remember concessions closes at 4:30 PM so come early enough to buy your permit or rent a boat.